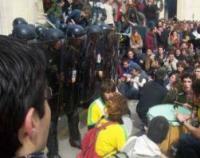 France: On Friday 10 November four people were jailed for their role in the struggle against the employment law the CPE. - 2 months' prison for Reda, Valentin and Pierre-Louis(with suspension). To that must be added fines of €5,800 for damages. The judge has also requested an expert assessment in connection with a claim by one of the police officers, who was off work for a month. If the assessment finds in favour of the policeman, then our comrades could face having to pay him a month's wages (including social insurance payments). The three other officers involved in the case as plaintiffs have also been authorized by the court to submit for assessment. The total amount that may need paying could amount to €12,000! On 1st June last, students at the faculty of literature in Marseilles university prevented the holding of the first "university/employment" debate at the university. The second debate, which took place in the "law" faculty saw some violent confrontations involving students, who were beaten back from the entrance to the hall by police, who were responsible for "security" at the event. Following a scuffle with the police, one Alternative Libertaire member, Jean-Pascal, was dragged out from among a crowd of students by police and beaten viciously, before being taken into police custody. The following day, three other militants, one of whom is an AL member, were the victims of targeted arrests by the anti-crime squad. This unjust verdict exemplifies the legal rampage which anti-CPE militants in France have been the victims of more or less everywhere. After its humiliation on the streets, the government is looking for revenge in the courts of "justice". This criminalization of social struggle has now reached the stage where it is enough for those in power to bark in order that "justice" is done. The withdrawal of the CPE was secured by means of a mass, united struggle. This determination and this unity must re-emerge to defend our comrades when they are prosecuted.